In this Barking Dog, Animal Communication session I share the story of Charlie the dog and how he overcame his fears to feel happy and relaxed. 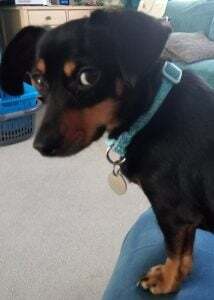 Charlie is a Sausage dog crossed with a Chihuahua. 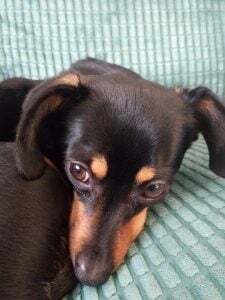 I learned about Charlie from his human Angela and she said that while he was a sweet little doggy he wasn’t getting the best out of life because he was just so scared of everything. Angela explained that he barked at everything and it was making things difficult, like being able to go out on walks and playing the garden. Charlie sounded like the sort of barking dog animal communication would be able to help, as my work as an animal communicator and energy therapist, so Angela and I made an appointment and booked a session. Meeting Charlie, the scared dog. When I arrived at Angela’s house it was quiet. I took my shoes off in the hall and we went through into the lounge and everything changed. 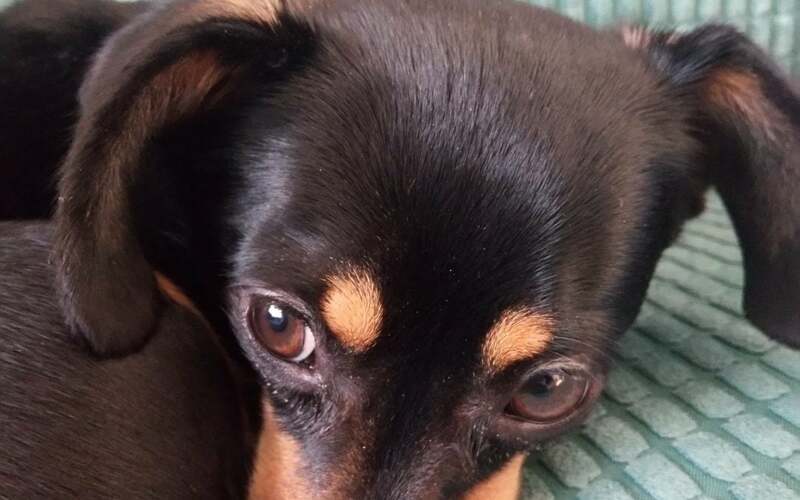 I was greeted by a very small dog in Angela’s arms, a very handsome black and tan boy barking’s head off at me. Angela explained he wouldn’t do anything that he will bark at me and sure enough he barked and barked and barked and barked. It was plain to see that he was very fearful of me in his home and he was telling me that it was his home. While I sat on the floor he would come running up to me barking and run-off: he wanted to say hello, but his feet couldn’t let him. Angela and I sat and talked for ten to fifteen minutes. Whilst we chatted he sat near Angela barking at me, desperately wanting to sniff me but still running away barking. We carried on regardless and eventually he started to calm down and finally plucked up the courage to come and sniff me. That made it easier for Charlie to come back and sniff me some more. Once that happened, he realised that he didn’t need to be afraid and came and sat my lap for a lovely cuddle so much so that I started getting a little nudge to carry on. I started off doing the animal communication initial assessment with Charlie to find out what sorts of things would help him with his fear. I used a kinesiology technique called muscle testing to find out what complimentary therapies and energy techniques would be right for Charlie. I worked on looking at four out of the five priority techniques including animal communication, energy work, nutrition, Bach Flower Remedies and colour therapy. I then sat on the floor and had communication with little Charlie and he shared with me what was going on with him: why he didn’t want to go for walks, why he barks so much and what we could do to help him. He said he felt very scared that fear drove most of his behaviours explained why the long walks outside made him feel unsafe, the noise, and the scary big sky. He asked if you went outside if you could go somewhere where he couldn’t see the sky so much, perhaps along the edge of the woods. When asked about training he said that he felt I could make a difference, so I recommended some local ladies that I know are very good at this style of dog training. I went on to do some energy work with Charlie to help in release some of the fear he was holding in his body. It was clear to see he’s a delightful little Chihuahua missing out on such fun in his life. We worked together using an energy technique I’m trained in, as an Energy Therapist and EAM Mentor, called energy alignment method (EAM). Energy shifting with me is that I start to yawn. 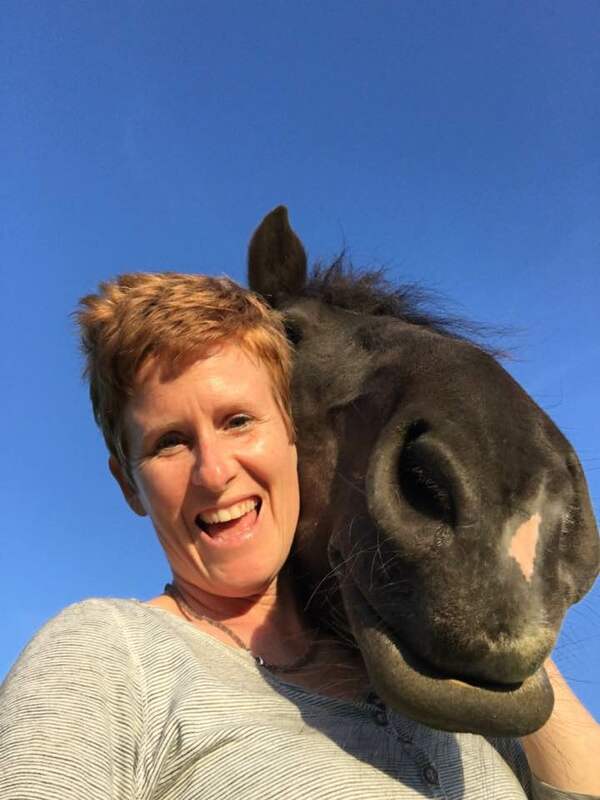 Charlie asked to be held in my arms while we did this work together, and as we both yawned we were working together releasing stuck and resistant energy in his body, which I then transformed into feeling relaxed, happy and confident energy. I used muscle testing to identify which Bach Flower Remedies to include in his custom remedy and I then created a custom blend for Charlie. Angela and I chuckled at just how much Charlie had relaxed in his session with me and that we became friends through working together. I explained that I would send an email to Angela with a summary of the things that she needed, according to Charlie, along with some links to places where she could get additional support or information. Charlie had a message for Angela, he wanted her to help him build up his courage. It was no surprise really, the meaning of some of the flower remedies in his custom blend were for support, courage, confidence, and security. I also did some Reiki and other animal healing energy work on Charlie to help him balance his energy, especially his root chakra, which was not really flowing or supporting him. Less than one week later I went back to Angela to see them both and was pleasantly surprised, despite Angela telling me that he was very chilled out, to see just how chilled out Charlie was when I walked in the door. He didn’t so much as bark, not once! He was over the moon I was there and quietly jumped up to say hello. Angela explained that she had a different dog! So much so, her daughter had asked her what she done to him. Angela said she tried him taking him on some very short walks and even went to the vets. The vets being something that previously would have been very stressful for her and Charlie. She said that while he was uncomfortable being in the car ride it was absolutely 100% different to how it ever been before, he wasn’t barking, and he wasn’t hysterical. I was over the moon to hear such lovely feedback because I know how much it can distress us as animal lovers, when dogs are not relaxed and barks his head off. Charlie is such a dear little boy, it’s so lovely to hear that his life is taking a turn for the better. If you are worried about your dog and think it could be an emotional issue then get in touch. I always prefer to chat over a cuppa (virtually) before working with anyone so do book a complimentary call in to have a chat about your situation here.